According to court order I met Sai last on 26th December 2018 with his brother Ramdev, when he was taken to the Nagpur Government Medical College Hospital (GMCH). Usually, I see Sai through the barred glass panes of the mulakat window. I saw him after a long time in flesh, and I realized his condition was worse than I realized. His mobility is almost non-existent, he cannot move himself at all or with great difficulty. His hands are shivering uncontrollably and he has lost a lot of weight. The health condition of Saibaba is much worst. Previously he could able shift him from chair to cot and back. Now the situation is so critical that at least two people have to lift him from the wheelchair on to the cot. My brother-in-law and one police personal physically lifted him many times during the tests on 26th Dec 2018. The entire process was video recorded by three different videographers. I request you to get a full and original (not edited) copy of the video in which one can see (including Honourable Judges) the pity of Dr. Saibaba. He had to be physically picked up by helpers and placed on the bed from the wheelchair and back again. He is unable to move out the wheelchair by himself as he previously used to do. According to the court order for the second opinion of the family doctors, the court ordered for the visit of doctors to GMCH and was allowed to perform tests in the presence of the government hospital and give a diagnostic report based on the results of the tests. Dr Gopinath, a cardiologist, conducted these tests. On 26th Dec 2018, the time given by the court (from 11 AM to 3.30 PM ) was hardly sufficient to make examinations and tests only by one doctor i.e Dr. Gopinath. If all three doctors were present, then it is impossible to complete the examinations. Iʹve attached the said report to this post. 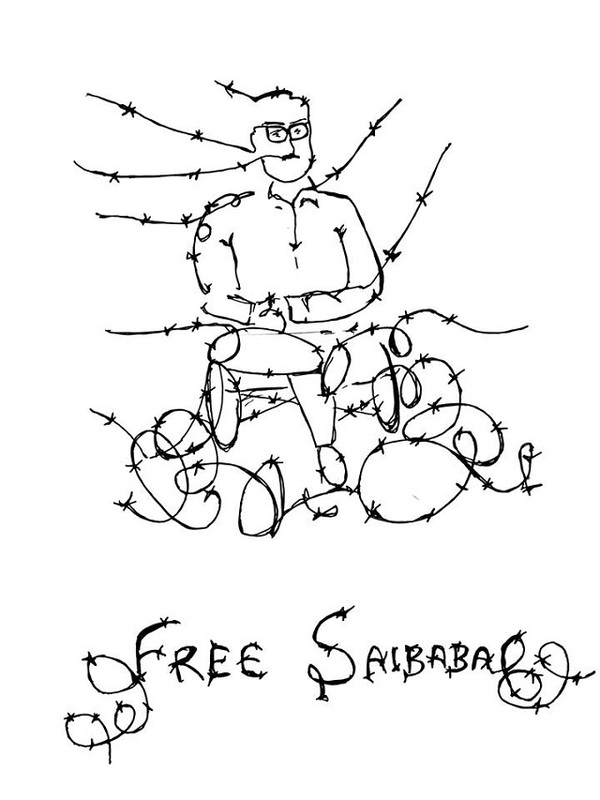 Saibaba has developed numerous other problems in jail, apart from, as the prosecution maintains, his gall bladder stones. They are only willing to conduct surgery for the removal of the gall bladder stones, burying all the other serious health problems that plague him. Sai is suffering with 19 health problems. Saiʹs problems include a mysterious lump on his left side, cyst in the brain, life-threatening heart problem, stones in kidneys, urinary infection, and many more. Left hand shoulder nerves further damaged and continuous shooting pain increased. Doctors advise for a regular physiotherapy. He needs comprehensive medical treatment, everyday physical and occupational therapy and continuous looking-after by the family. Several of the tests recommended by the doctors of the government hospital itself are not available in GMCH and thus it was recommended that to a Higher Super Speciality Hospital. The worst thing in the cell is that it is open and exposed to cold. He has been facing worst attacks of cold. His legs are freezing because of the icy cold and cramps in legs and hands are killing him. Inside cell the temperature is further less so he is facing the worst. His left handʹs damaged muscles have got frozen. HOD of Neurology wrote on the medical record left shoulder is frozen and ordered for immediate therapies. He needs regular physiotherapy. Without family members help he may not able to do physiotherapy. The pain is worst. He is living in a dangerous edge of life. He canʹt bear pain more. On 24th January 2019, the Defenseʹs final arguments concluded. The next hearing, consisting of the Stateʹs final arguments is on 11th February 2019. It has been almost 2 years since Saiʹs conviction and 11 months since we applied for medical bail. The process has been dragged on and meanwhile, his medical condition has become severe. He is falling unconscious frequently, he is so weak unable to write and he cannot consume solid food properly. As a 90% disabled person, his rights are in severe violation. Dr. Saibaba is in a narrow passage, struggling between life and death. I hope that the honourable court upholds his basic human rights and his rights as a disabled person and grants him medical bail by the next hearing, otherwise it would be very difficult for him to survive.